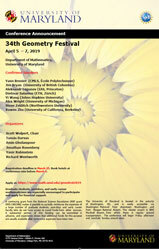 Everyone is invited to the Geometry Festival, and graduate students are especially encouraged to attend. 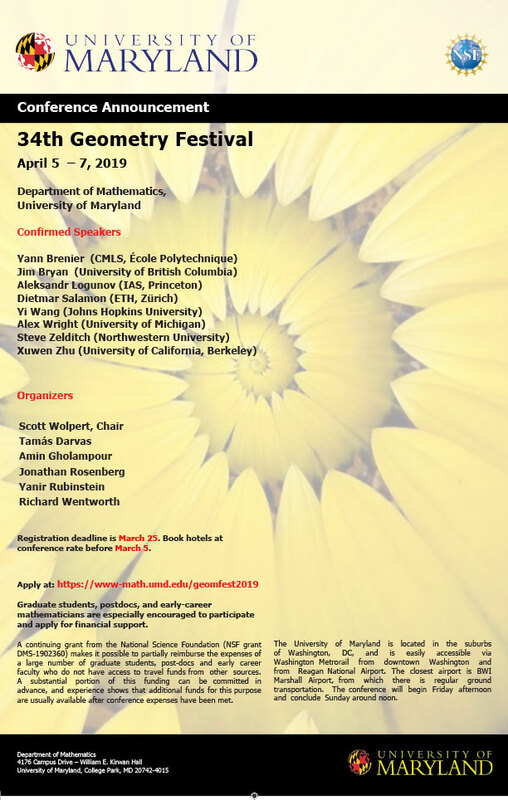 Support for this conference also comes from the Department of Mathematics at the University of Maryland and from the National Science Foundation. Funding is available to partially reimburse the expenses of graduate students, post-docs, and early career faculty who do not have access other sources of support. A portion of this funding will be committed in advance, and additional funds for this purpose are usually available after conference expenses have been met. The deadline for registration is March 25. Hotel reservations should be made by March 19. Please see the links on this page for instructions.